A magazine is a means of communication. Therefore, beyond what or who will be published, its first duty is to define ‘how.’ In that logic, the cover is a key feature: since it is the first thing that a reader sees, it must be able to capture attention and convey its own identity. 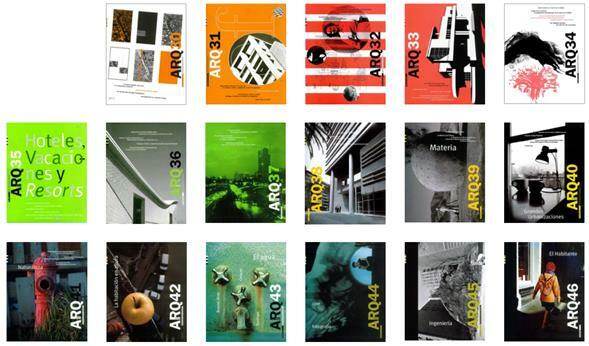 The first 6 ARQ magazines had no cover, or at least not one confirmed through a type of paper, the use of more than one ink, flaps or any other of its characteristic features. Many do not know these issues or, if they do know them, they do not consider them given their flyer format - known in the field of publications as ‘microzine.’9 They are copies of an original piece made in kraft paper, unbound, and difficult to preserve or read - even for us as a publishing house. The logo merges with the school’s name and, in its place, the central topic stands at first sight. Figure 2 Issues 1-6. Format: 27 × 40,5 cm; folded as a newspaper; Paper: kraft, 90 gr/ m2 copy; Inks: 1/1; Integrated graphic elements: logo, issue number, headlines, texts, image. Except for the regular readers, the choice of a magazine is made, in general, by its cover. (Del Castillo, 2013: 28). 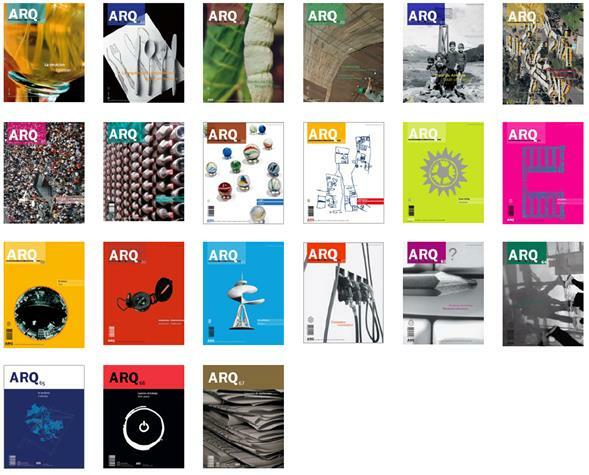 Popular knowledge indicates that ARQ’s first issue is the one that combines Da Vinci’s Vitruvian Man with Le Corbusier’s Modulor in its cover, that is, issue number 7. The first in large format,10 with a black and red illustration, a small logo and a declared topic. Its bracket binding allowed it to be read rather fluently, and its distinctive content and design made it collectible and relatively timeless. This ‘first’ issue and the following ones became objects of desire for several generations of students and professionals. Without really knowing which issue is which, many remember, among others, the airplanes cover, the one with the hammer and the spatula, or the one with the math signs - the first 13 illustrations by Alex Moreno and the following ones by José Neira. Their powerful simplicity is renowned, just like their content. 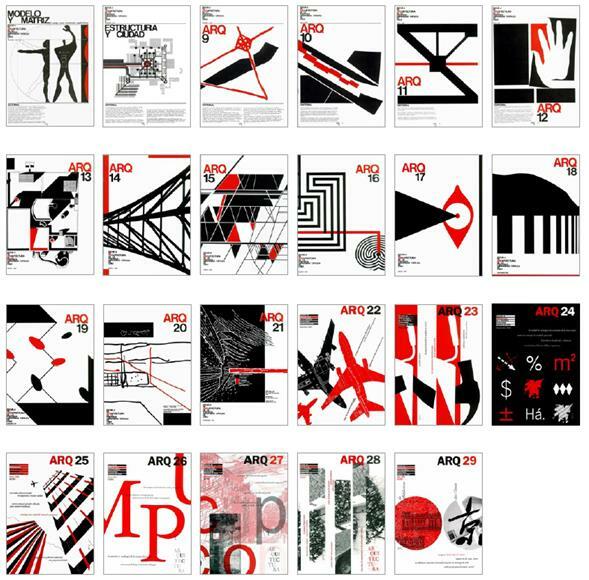 Between the issues number 7 to number 12, the editorial is still placed at the lower side of the cover, the logo continues to be semihidden and the topic is emphasized in big size at the top on the left (the latter only until issue number 8).11 Between the issues 9 and 21 the ARQ logo is highlighted in red and, together with the number of the issue, moves relatively free throughout the cover. Between issues 18 and 29, the logo is fixed, for a period, far at the right side of the cover. Figure 4 Issues 30-46; format: 24,5 × 31 cm; paper: Aquarello 200 gr/ m2 (30-31), Magnomatt 250 gr/ m2 polylaminated; inks: 2/1 (30-37) - 4/1 (38-46); integrated graphic elements: logo, issue number, theme (since issue number 38), headlines and image. Over time, the size of the publication decreases,12 the logo is emphasized, rotated and located indistinctly on the right or on the left side of the cover. The cover illustrations became complex assemblages of photographs, types, and drawings by designer José Neira, with the flexibility allowed by papercuts and a full knowledge of how to use flat inks and overprints. Headlines circulate freely, establishing certain diagonals or tensions in each issue. The magazine is no longer thematic, so the contents inside can be read on the covers without the need of being literal. Figure 5 Issues 47-67. Format: 24,5 × 31 cm; paper: couché 300 gr/ m2, polylaminated; inks: 4/1 (up to issue 54), 4/2 (55-57) - 4/4 (58-91) integrated graphic elements: logo, issue number, theme bilingual, image and flaps (since issues 57 and 58 only front flap is considered and removed from 59 onwards). In time, the use of colors became the common element, until today. From issue number 38 and on, the central theme is manifested both in images and headlines that, gradually, become more synthetic and clear. Some come to mind easily because of their strong link with the main topic: the yellow buses’protest in the issue Desplazamientos (mobility) (ARQ 52), the marbles in Juego (game) (ARQ 55) or the one with the drawing En planta (the plan) (ARQ 58). The issues 71 to 73 present engravings by Nemesio Antunez and 74 to 76 drawings by Roser Bru; both artists and Montserrat Palmer’s friends. Figure 6 Issues 68-91. Format: 24,5 × 31 cm; paper: couché 300 gr/ m2, polylaminated; inks: 4/4; integrated graphic elements: logo, issue number, theme bilingual, headlines in some issues, image, flaps and bar code. After 30 years, between issues 77 and 88 it was decided to pick up some of the earlier codes, such as the use of red and black and the mixture of drawing, text and image. With a certain nostalgia, many perceived this nod to the past on covers that could be either typographic, abstract or photographic, according to the combination of its elements. 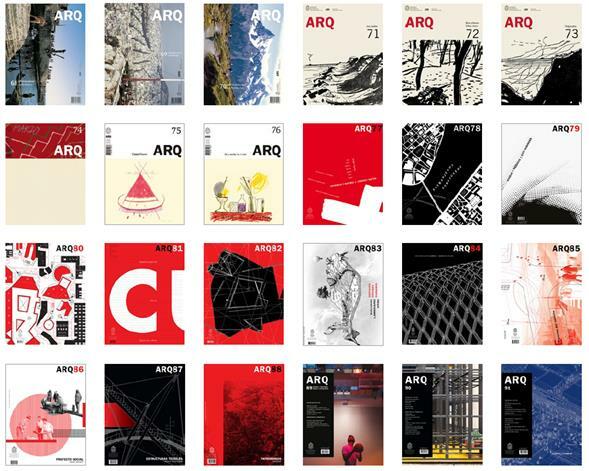 ARQ’s last 11 issues have undergone several changes; the necessary adjustments for the beginning of a new stage. Perhaps the most appreciated one is the possibility to have a full cover - i.e. cover, spine and back cover. The issue’s topic is shown in the drawn background grid and complemented with a list of contents and authors. Along with a considerable increase of pages, from issue 92 and on, the magazine’s size was reduced to make it easier to carry.14 This last year the covers are black plus a neon color in flat ink, with icons or drawings and a centered logo, together with the list of authors and contents. (…)our journal must be involved in the reader’s particular interests. It is the only way for keeping their attention. Our journal’s intention should be to present itself as a useful tool and must be clearly shown as a solution to the reader’s problems (Del Castillo, 2013:16). 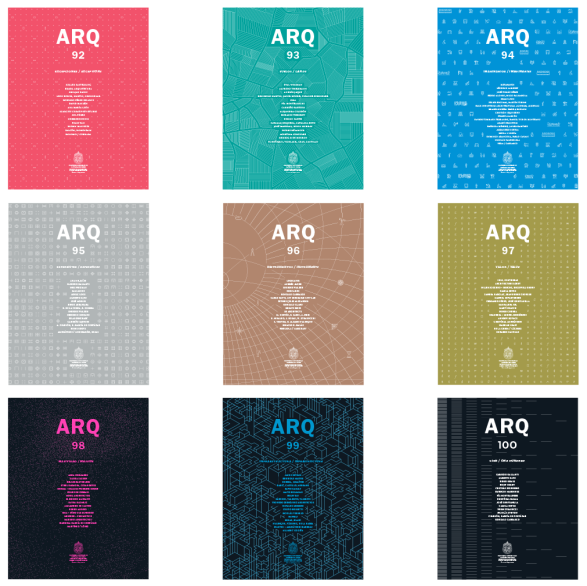 I do not think that arq has solved many problems, but I rather trust that many have been raised and multiple doors have opened to new questions and ideas. We will continue trying to find new possibilities. Architect and Master of Architecture UC (2005). Master in Editorial Design and Digital Projects, Escuela Superior de Diseño de Barcelona and Universidad Internacional de Valencia (2017). Digital graphic design studies, MacPC Academy (2015). Has been art director and independent graphic editor of both printed and digital publications, professor at courses related to architecture and design and a collaborator for architectural offices in the elaboration of graphic material for publication. 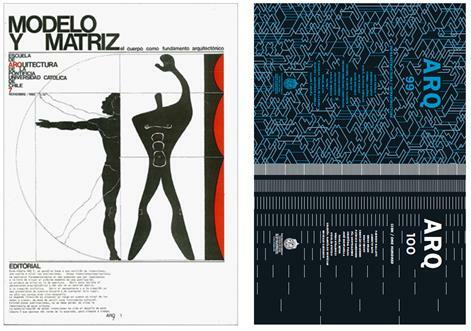 Since 2003 works at Ediciones ARQ, where she is currently graphic editor.